Large rectangular softboxes are the perfect size and shape for portrait, glamour and fashion photography because not only do they produce a natural looking catchlight, they are also perfect for imitating natural window light. Our large rectangular softbox is large enough for full length portraits, and when rotated it is also ideal for group shots. It has a deeply recessed outer diffuser so it is also ideal for controlling light spill, especially when using it to light the background or to feather the light. 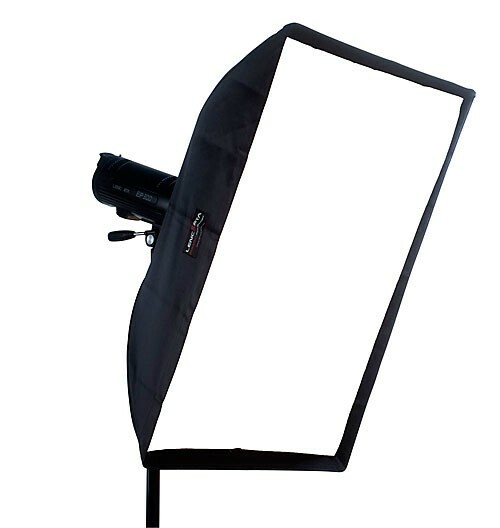 Fitted with both an inner and an outer diffuser, both of which can be removed if required, our large rectangular softbox can produce both soft lighting and a much harder, specular light. It takes only seconds to remove or replace the diffusers.